Power cord, KVM cable, & rack mount kit included, KVM switch as optional. LED Indicator: Provides a quick visual indication of your unit's status. 1U rear mounting: Mount a KVM switch easily in the same rack space. Occupies 1U of rack space: Conserve valuable rack space in the data center. Multi-platform Support: Windows, Sun, Unix and Linux compatible. Integrated Touchpad Pointing Device: Eliminates the need for a separate, external mouse. Power tilt sensor: Save power by automatically powering down the device when it is closed. PS/2 terminations: Connect to a server or KVM switch via standard PS/2 connectors. Standard VGA connector: Connects to a server or KVM switch via a standard VGA connector. Low Cooling requirements: Emits less heat than comparable CRT monitors. Low Power Consumption: Uses less than half the power of comparable CRT monitors. Slide rails: Quickly and easily install in square, round, and threaded hole racks. Quick release tabs: Insert or remove the device with ease. On-Screen Display (OSD) adjustments: Adjust the on-screen image, including auto adjust, exit, power on/off, brightness, menu, and a power indicator. Cable management arm: Prevent interference with surrounding devices by organizing multiple cables. 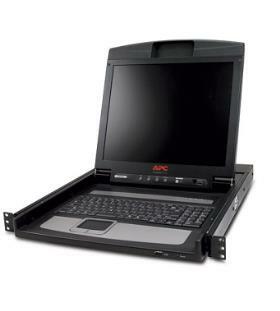 1U rack-mountable 17" LCD console with keyboard, touchpad & mouse. 1U rack, 44mm x 482mm x 614mm. Trackball Type: PS/2 Touchpad, USB mouse. C-tick, CCC, CE, EN 55022 Class A, EN 55024, EN 60950, FCC Part 15 Class A, GOST, IEC 60950, Industry Canada, KCC, NOM, UL Listed, VDE.